For fans of The LEGO Movie franchise there's plenty to enjoy here. But more importantly, even if you've never seen a LEGO movie or a Batman movie, you won't feel out of your depth. Thankfully the script avoids an origins story, or any real explanation as to why Batman is Batman - although we do learn how Tim Drake was adopted by billionaire Bruce Wayne (spoiler alert: Wayne is also Batman) and eventually becomes Batman's sidekick, Robin. The movie basically tackles Batman's many issues, like trust, humour and his ability to admit he has any feelings at all... not to mention that his ongoing battle with The Joker is futile. Over the course of the movie, Batman's (Will Arnett) interactions with The Joker (Zach Galifianakis), Barbara Gordon (Rosario Dawson), Robin (Michael Cera) and Alfred (Ralph Fiennes) make him realise that he's got serious trust issues and maybe, just maybe, if he let people into his life it would be more fulfilling. If you're a fan of Batman throughout the ages (from comic book, to '60s TV series, to the numerous films) then you'll also get a kick out of the jokes that poke fun at his previous exploits. It also asks the difficult questions: Like why, if Batman is so good at cleaning up the streets of Gotham, is it still the city with the highest crime rate in the USA? There's also a subtle, tongue in cheek dig at the recent Suicide Squad movie. In fact, if you watch the film a number of times you'll notice various little asides that you may have missed on the first play through. The only extra is One Brick at a Time: Making The LEGO Batman Movie (15 min) which is a quick look at various aspects of the movie's inner workings. 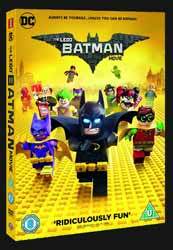 Overall it's another fun LEGO movie which can be enjoyed by every member of the family.